Modern Times, the physical entity, is really starting to materialize (fund raising is complete, some hop contracts have been signed, and Jacob is hoping to finalize a lease for a building over the next few days, which would leave a head brewer, and a brewing system high on his to-do list). In addition to brewing test batches, I’ve been spending time thinking about my brewing philosophy. What kind of beers am I truly passionate about making? At this point there are so many American breweries putting out excellent straight-ahead versions of most classic styles that it would be tough to come into a big beer nerd market (like San Diego) and beat them at their own game. I’m not sure I would want to anyway. The recipes Jacob and I have been developing aren’t weird or wacky, but beers similar to them aren’t available in abundance. Beers like moderate gravity saison, hoppy American wheat, coffee/oatmeal stout, and red/rye IPA. Sure there are already solid versions of all of these beers on the market somewhere, but none of them are available from more than a couple breweries at the average craft-beer-centric retailer/bar. I respect what breweries like Short’s and Cigar City do, finding unique and interesting ingredients to add to their beers. While these flavors sometimes work well, see Cigar City’s Cucumber Saison, even with perfect execution I rarely want to drink more than a taster. That doesn’t mean that I don’t go out of my way for the experience of trying their beers, but I won’t be buying a case of Short’s Carrot Cake anytime soon (even though the flavor captures the dessert perfectly, down to the cream cheese icing). One of my goals is to brew beers that I want to drink frequently and in quantity. I want to brew beers that bring a level of sophistication to recipe and ingredient choice. I’d rather see beers designed in the same way chef’s create recipes, rather than someone playing a game (i.e., who can get the most IBUs/alcohol/malts into their beer?). I think breweries that have a vision, and brew to their own palates have the most success. Rather than adding an ingredient just to put it on the label (a brewer-friend once mentioned that they contract brewed a raspberry honey wheat that contained a single ladle of honey for a 30 bbl batch), we will focus on picking exactly the right quality and quantity of a fruit or sugar to achieve our desired flavor. Fruit, honey, spices, herbs, hops, malt, microbes, and barrels are not all created equal. If we aren’t able to do something right or get a high-enough-quality version, I’d rather wait until we can. Working to procure locally sourced and seasonal ingredients is going to take time and practice, but I’m confident that it will pay off over buying bulk fruit puree or bland pasteurized honey. It also means taking the time to select the ideal strains of microbes for any given sour beer, rather than having a single all-purpose house culture. As a homebrewer I’ve only have to worry about creating beers that suit my palate. I don’t mind spending a few extra dollars getting “the best” ingredients. Commercially that isn’t always an option in terms of both the profitability of a beer and the availability of certain ingredients in amounts large enough to flavor a 1,000 gallon batch. Luckily southern California has a much wider array of produce for a longer season than I’m used to in DC. Jacob and I generally agree on what we want in the beers, but at times we’ve had differing opinions on what direction to go. I’m confident that together we’ve been able to dial in our recipes better than either of us could have on their own. I’m excited to get out there and start translating what I’ve had success with at home into the production environment; it should be a blast! 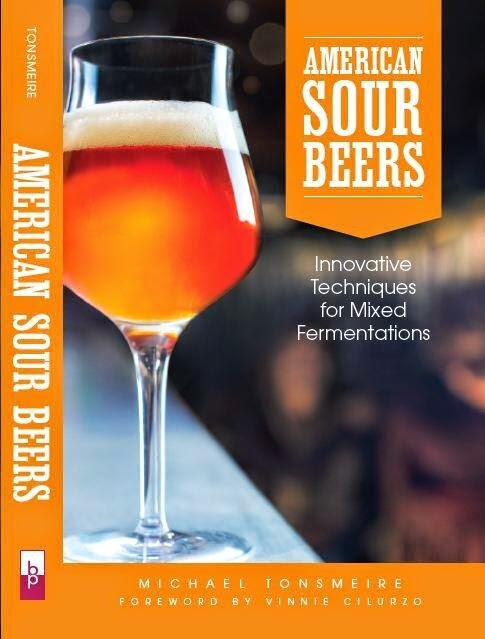 For a bit more detail on Modern Times, as well as the book, and some more of my brewing philosophy, check out the interview that White Labs just posted with me over on their YeastBuddy blog. Nice write-up Mike. I'm in the same camp as you in that I appreciate the unique qualities of off-the-wall beers, but at the same time would rather drink a lot of well done base styles. From a drinking standpoint, its exciting to try beers with unique ingredients simply because you don't really know what to expect as compared to a to-style Czech Pils or IPA. On the other hand, from a brewing standpoint, I have come around to wanting to brew base styles to the highest quality I can without compromising the traditional concept with qualities that may impede or distract from the core element of the style. The debate brings about such ambivalence, ahhh!!! Excellent point on not all ingredients being equal. I think breaking down the recipe and process into small components and finding the best way possible to do things is what separates good breweries from great ones. The exact same honey ale recipe can taste very different depending on where the honey came from and how it was used (got a kick out of the "ladle of honey" story btw). It's frustrating when you read a well thought out cooking recipe and the last ingredient is "light lager like Budweiser", but at the same time I circle that ingredient and say "Ok, that's an area where I can improve this recipe." The same strategy can be applied to brewing. I like good examples of a particular style. I've had a ton of IPAs but I always look for a better example of the "perfect" IPA. The two that I love dearly are O'Dells IPA and Stones IPA. Just the plain ol IPA. Certain beers ARE the style. Weihenstephan Hefe is THE hefeweizen beer. The aventinius weizenbock is THE weizenbock in my opinion. So finding new beers that redefine the style is always nice. Thats what I go for. Thanks for sharing your creative and technical processes with the world for free. You deserve the honor to have your beers brewed with a longer length, and as someone living in San Diego, can't wait to have them. Most of the breweries here are focussing on what sells, and outside of Lost Abbey, there really isn't a solid source for sour beers. There are plenty solid "prefer to drink" beers here, The creative stuff will stand out in San Diego. It seems like you have a good plan going forward, but I'm curious how you plan on dealing with the negatives of hop contracts and the fact that you'll likely end up brewing a lot with plain old 2 row, when you typically haven't in a home brew realm. Can you comment on what kind of brewery Modern Times plans to be? Maybe a comparison? It is true that while there are plenty of advantages to brewing beer on a commercial scale, there are several drawbacks as well compared to homebrewing. Luckily we don't have a lot of beers planned that require the subtle maltiness of a specialty/imported base malt (things like English Bitter, Vienna Lager etc.). Although for less frequently brewed batches we may haul sacks of malt. We'll be brewing test batches, to see if we miss the characters lost from switching from Maris Otter to American pale (in say the Coffee Oatmeal Stout), and if the switch requires a small addition of something like brown malt, Victory, biscuit, or melanoidin to get the flavor we want. Hop contracts will be annoying to deal with, especially early on because it is so tough to know which of our year-round beers will be hits and which will need to be adjusted. We're planning to brew a lot of seasonals and one-offs, any hops we've contracted for will find their ways into something. Surly has been a role model for both of us. In terms of having really excellent year-round beers in cans, terrific seasonals, and being a production brewery first and foremost. There will be a tasting room at Modern Times, but it won't be a brewpub. We'll be focusing on the local market to start, we aren't going wide and shallow like a lot of the more interesting breweries are. Most of the really fun stuff (sours etc) will be sold mostly on premises, at least to start.